Close your eyes and picture an email marketing list that's full of valuable, verified sales leads. Now, open your eyes and buy it: The museums and art galleries mailing list you need for your next marketing campaign is right here at Bookyourdata.com. The first step in marketing any product or service is compiling a list of contacts that you hope will be your future customers. This can be a painstaking, time-consuming process, but it doesn't need to be that way. Here at Bookyourdata.com, we've sculpted a useful, accurate email database of art galleries and museums that you can download and start using in minutes to reach out to sales leads. Cultural institutions like these don't have time to waste, and neither do you. That's why we make it fast and simple to get the pre-built email marketing list you need, and that's why we dedicate so much time and effort to make sure that each business database we offer is filled with current, usable information. 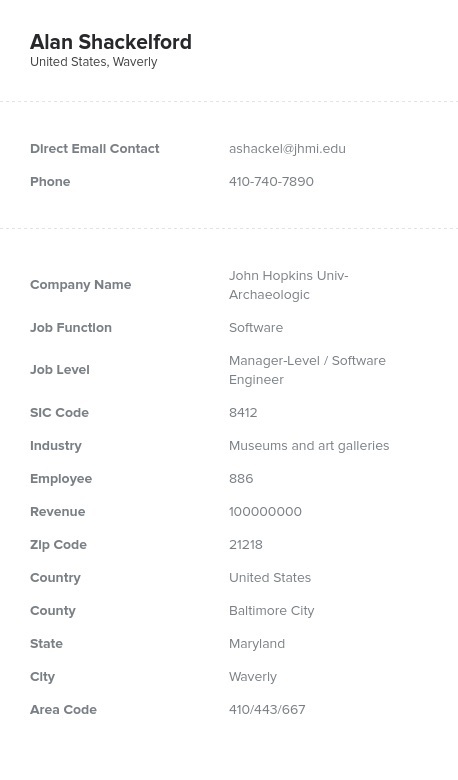 Our museum mailing list, like all of our business lists, is regularly put through an automated verification process. Then, it's examined carefully by human authenticators who scrutinize every detail to pick out any errors that might have been left behind. The value of art might be in the eye of the beholder, but the value of this art gallery and museum email list is plain to see. Buy it today and you'll be on your way to a successful marketing campaign!